Bed linen and change included. The property was exactly as described. This is a very well maintained, clean and spacious 3 bedroom flat. The owner, Mari, was extremely friendly and was waiting for us on arrival. She speaks no English but has an iPad translation tool to assist. Definitely be more than happy to select this flat again if going to Gran Canaria. We would say that this is excellent value for money and possibly almost cheaper than necessary for the size and quality. There is on street parking and we never had any problem finding a free parking space on the same or an adjacent street. It is only 5 Kms from the Airport, 0.5km from the main GC1 motorway and 10 Kms from Las Palmas. However there was no noise from either motorway or airport and the apartment was in a quiet residential area. This is totally non-tourist area. There is a wonderful and very cheap bakery just on the next street and the local shops and petrol station 100m away. There is a large supermarket 2Km up the GC1 motorway. This is an excellent base for exploring the island. There is a small beach at Melonara less than 5 minutes drive away. To get to Maspalomas is 30 minutes drive down the GC1. From here you can get inland and explore very easily thanks for the easy access to the motorway network. If there were any criticiscm it would be that the Internet is very slow, although this is due to being on 3G which seems to be the same for most of the island. There was an issue 1st night with the kitchen losing power. On phoning Mari she was around in less than 10 minutes, then had an electrician the same evening and had a plumber the following morning to make the necessary fixes. Could not have been more attentive and helpful. Great apartment with a wonderful owner/manager. I must say the apartment was well worth its price. Comfortable stay for 6 people, every amenity you could think of. Clean and well equipped it was a real nest you wanted to come back to after a busy day. We had two cars rented and there was always free parking space available close to the apartment. We thoroughly enjoyed our stay at this appartment, and our interactions with the owner were most pleasurable. The rooms are ample, and all the linens, kitchen utensils, etc., were provided. The appartment is extremely clean and well taken care of, as are all its contents. It is very easy to get to various destinations by bus from this area, and markets, pharmacies, bakeries, places to eat, etc., are all close by. This was our first experience abroad with an appartment, and it will definitely not be our last. *****Este apartamento es muy amplio, y se ve que siempre se mantiene muy limpio y muy cuidado. Fue un verdadero placer conocer a la duena, que fue muy amable con nosotros. El lugar es tranquilo, y tiene muy cerca lugares para comer, mercados, farmacias, panaderias, etc. La parada de autobuses tambien esta cerca y es muy facil orientarse para ir a diferentes lugares. Definitivamente recomendamos este apartamento y esperamos poder volver en un futuro. Mis más sinceras gracias y mi cariño, para las buenas personas que han pasado por mi casa, donde siempre seran bienvenidos de nuevo. Este trabajo me gusta mucho y lo hago con todo mi amor, siento que voy formando una familia alrededor del mundo, muchos de ellos han vuelto de nuevo y eso es un orgullo para mi. Saludos y muchas gracias por haber confiado en mí, que la salud y la suerte los acompañen. My sincere thanks and my love for the good people who have been through my house, where they are always welcome back. I love this job and do it with all my love, I feel I'm building a family around the world, many have returned again and that's an honor for me. Greetings and thank you very much for trusting me, health and luck accompany them. We had a very good stay in this very nice appartment in El Calero (Telde). The landowner is very nice, answer any questions very fast and did everything she could to welcome us and make our stay as good and reliable as possible. 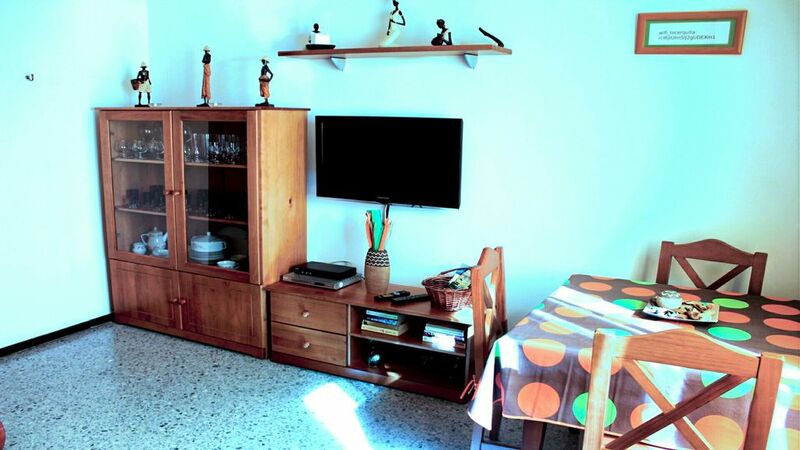 The appartment is large, have nice bedrooms for privacy and is equipped well. Big bathroom with enough warm water and a fast WIFI. We stayed for a cycling training camp, and it´s a very good location to start your ride, either you want to go into the mountains or find more flat rides. The appartment has an excellent garage for bike parking which make things very easy. You´ll find good grocery stores, bakeries, bars , and cafes in close proximity. It´s even fairly close (a couple of km of walk or run) to very nice beach towns (ie. Melenara) that many tourists don´t realize exist beacause it´s much more usual to go further down south. These beachtown, however, are more pitoresque , with great sand beahes, palmes and cozy cafes. If you are more into shopping, it´s just a bus stop or two away from large shopping centers. It´s of course a very dense inhabited place in Gran Canaria and close to the grand highway GC1, so one should be prepared for a bit of traffic noise, even in the night. In total, a very nice accomodation that I reccomend highly. Excellent séjour dans l'appartement de Mari Carmen qui est très accueillante. Appartement très propre et bien équipé, au calme dans un quartier facile d'accès, proche de tout pour visiter l'île et avec une jolie plage à moins de cinq minutes en voiture. Pas vraiment de terrasse pour profiter de l'extérieur c'est le seul bémol, (c'est un appartement de ville) mais l'excellent rapport qualité/prix compense largement ce petit manque. Merci encore Mari ! Muchas gracias a Danielle y Joseph por su estancia, son personas amables y cercanas, muy limpios y cuidadosos con la casa. Personas como ellos hacen muy facil este trabajo, cuando decidan volver estaré encantada de recibirlos nuevamente. Central holiday flat, 3 bedrooms, 1 bathroom, kitchen, living room and second floor balcony, bright, furnished and equipped. Consists of: bed linen, towels, LCD satellite TV, refrigerator, microwave, coffee maker etc.. It is located a few meters from the GC 1 main highway to Las Palmas with the South, is surrounded by shopping malls as Auchan, Decathlon, Eroski, the Terraces, etc..
1 mile to several beaches, including 3 awarded by the European Community Blue Flag (Melenera, hoya well and Salinetas), beach ideal for wind surfing Man and a fishing pier, long boardwalks beautifully maintained. 7 miles from airport, 12 km from Las Palmas and 30 km south of the island. All services nearby: health center, supermarket, restaurants, banks, a few meters, transportation to the island.